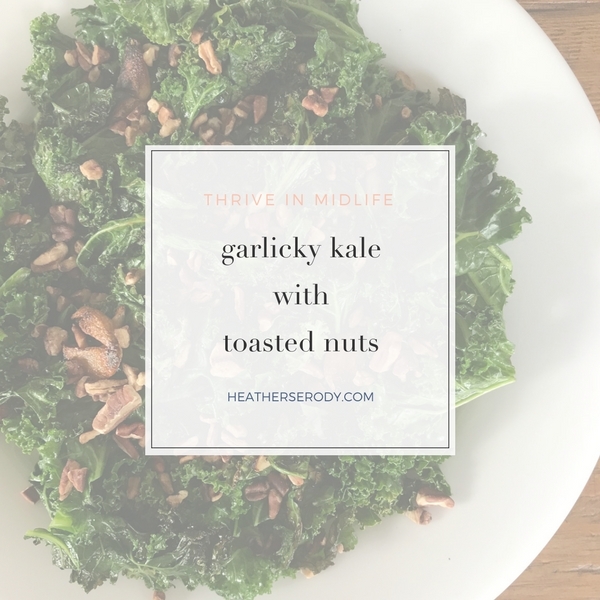 There's something really special about the punch of warm kale sauteed in garlicky oil, and topped with toasted pecans. It pairs perfectly with eggs for breaking-the-fast or accompanying my famous grilled salmon for dinner. 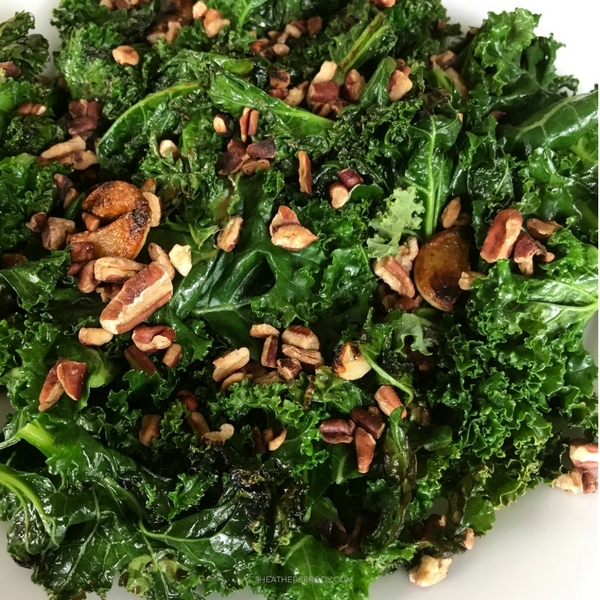 Use any type of dark winter greens or nuts for this recipe. To toast the pecans put them in a small dry frypan over medium heat, tossing occasionally, until they are just starting to brown and smell fragrant – about 5 minutes. Set a large heavy-bottomed pan on the stovetop to preheat over medium-low heat. Rinse the greens under water to clean them. Don't worry about drying them, as the remaining water will help them cook. Add the avocado oil & garlic cloves to the preheated pan and let the garlic cook about 2 minutes, tossing them in the pan to infuse the oil with the garlic flavor. Don't let the pan get too hot or you will burn the garlic. When the garlic has softened and turned golden brown, add the greens. Using tongs, toss the greens with the oil and allow them to cook down about 3-5 minutes. The greens are ready when they have wilted but are still bright green. Remove everything from the pan and transfer to a serving plate. Chop up the garlic pieces if desired and arrange on top. Top with the toasted nuts & drizzle with a little more oil if desired. Serve immediately. All the products I recommend from Amazon can be found on my Amazon Keto Pantry Products List – click here for convenient one-stop shopping. Previous Post: « is oat fiber keto?